The Jet Pulverizer Company has numerous methods of particle sizing, the latest addition being a Horiba LA-960 laser sizing unit. Other methods include sieve testing, Fisher sub sieve sizer, optical microscope inspection, Scotts Biometric density meter and Tap density. Sieve Testing – Wet and dry screens from 6 to 500 mesh. Bausch and Lomb Optical Microscope – 1X, 2.5X, 10X & 25X lenses (1µ to 1000µ). Scotts Biometric Density Meter – Cubic inch. Tap Density – Manual 100 ml graduated cylinder. 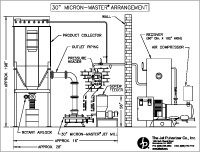 Jet mills are powered by a pressurized gas such as compressed air, nitrogen, or superheated steam. Compressed air is by far the most common input energy source for jet mills with input demand ranging from 7 scfm (1″ mill) to 2900 scfm (42″ mill), delivered at 100 psi. Nitrogen is used when processing materials must be maintained in an inert atmosphere to protect from oxidation and for those that are hygroscopic. The effect is to keep the powder very dry, preventing caking adherence on interior contact surfaces. Nitrogen is also used to lower the temperature at the material into its glass transition zone. Soaking and feeding powders at extremely cold temperatures in this way has an embrittling effect on the particles, enhancing fracturing. Superheated steam from a boiler provides the highest level of energy input and is often used in production lines that run 24×7 continuous operation. Steam can be used to process the most difficult to grind or convey materials or can be used to deagglomerate chemically engineered products. Lightweight and high-velocity steam power can be the most efficient form of input energy. Superheated steam also ensures a very dry medium for accelerating particles in a jet mill at very high energy levels. In rare instances Argon gas has been used on pyrophoric materials to prevent spontaneous ignition. In most applications, compressed air is used and a stand-alone air compressor sized properly for the application generally provides this air supply. A standard rule-of-thumb for estimating compressor hp rating is that one hp will produce about 4 scfm of air [4 scfm / hp]. 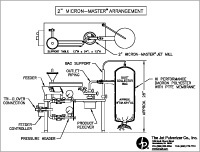 For example, an 8″ jet mill requiring 100 scfm of air would require a 25 hp air compressor. Air compressors should supply air that is dry and free of oil. Most compressor manufacturers can specify either a refrigerated or a desiccant type dryer that matches customer application flow rate, pressure, and moisture requirements. Generally, air supply should be delivered with a dew point of less than 35 F with less than 1 or 2 PPM of oil. Oil- injected screw compressors require in-line oil filters to achieve this specification. Oil free compressors are available at higher cost but may be required for certain sanitary processes. 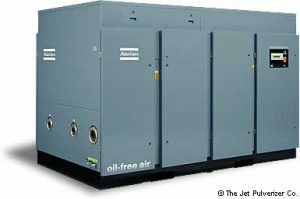 Oil-free compressors are generally high-efficiency multistage units and may be used to supply air at high temperatures by retaining the heat of compression. 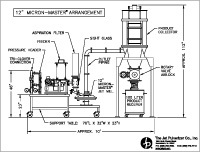 Jet pulverizer applications engineers make it a point to ensure that the customer understands the requirement for an adequate and properly conditioned air supply. Generally, customers either have sufficient installed compressed air capacity available at their facility or they make plans to increase plant capacity to accommodate the demand of their new jet mill. Upon request, however, Jet Pulverizer Co. will include a suitable air compressor in the jet mill system package quotation. Compressors recommended by Jet Pulverizer Co. are selected from those offered by various manufacturers on the basis of service and resource factors, and the individual features they offer. A reliable, controllable feeder of suitable design and capacity is necessary for proper operation of a jet mill. All jet mill system packages, then, are sold with an appropriate feeder, one that is able to handle the material efficiently and introduce it into the mill at rates required by the application. 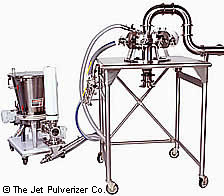 The feeders recommended by Jet Pulverizer Co. vary depending on materials and the requirements of the specific application. Customer requirements in this regard can vary widely, including provisions for wash-down, explosion-proof service, allowable metal contact, batch quantity, feed rates, bulk density, raw particle size, moisture content, flowability, sanitary service constraints and motor control. Volumetric feeders: feed raw material from a hopper through a helical metering auger. This is the most common method of feeding a jet mill by far. Volumetric feeders are specified with a range of hopper capacities and a range of metering auger sizes. Hoppers usually are designed with some form of agitation to prevent bridging thus assuring steady flow to the auger. Jet mills have performed very well with this type of feeder over a wide variety of raw materials. Loss-weight feeders: a variant of the volumetric feeder, feature a built-in scale (or other method to measure weight) with a feedback circuit that adjusts metering auger speed (or vibratory level) to match a preset dosage rate on the controller. As the end of a batch nears, auger speed (or vibration) may increase to offset the reduced volume entering the metering auger (or feed trough). These feeders also assure a constant delivery rate of raw material supply without regard to possible varying bulk densities. Powder density may vary between the top to the bottom of a hopper. Loss-weight feeders are easy to adjust to a new powder drop setting. Feed rates are easily converted into common units of measure (ie. pounds per hour, or grams per minute). Finally, process records may be better gathered and stored with computer processor aid. Vibratory feeders: are the simplest design. They convey raw material along an open vibrating v trough. These feeders draw material from either a simple powder funnel or a stainless steel hopper. Merits of this method include 100% material utilization, inherent suitability for extremely small sample sizes, reduced friction that may cause reaction in temperature sensitive materials, and allows for easy viewing of the feed stock. 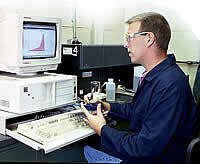 Minimizes the dust explosion risk when processing combustible powders. 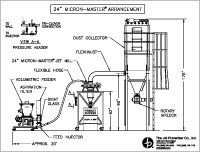 Jet Pulverizer engineers will specify dust collector features to provide a safe, effective, and efficient system for your material handling requirements.